Josh Berman has once again created an album built on traditional themes but with highly evolved modern structures. There Now, his latest with a revolving but closely knit contingent of the Chicago free jazz scene, Berman combines the aforementioned ideals and presents them all anew for the modern generation. It's a blast to listen to--even for the newcomer to Berman's world! There Now is a superb homage to late '20s large ensembles, not that unsimilar to Josh Berman's outfit. 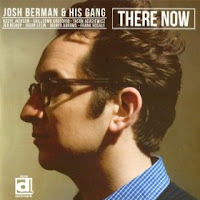 But Berman also drops in his own compositions which fit nicely and build a bridge between past and future. The group work through new Berman material as well as classic but rarely heard tunes and really put their own stamp to it. "Sugar" is almost unrecognizable under Berman's arrangement. A tune originally featuring the great Jimmy McPartland on cornet, Berman's version keep the fresh ferocity of original but infuses it with modern tempos and free movement that is reminiscent of his work with Chicago Luzern Exchange. There's a killer solo by the versatile Frank Rosaly towards the end the Gene Krupa would be proud of (or he'd probably yell at him for being so good). "Cloudy," a Berman original, Bishop and Jackson takes the early lead with strong exchanges which are fascinating to absorb. The latter end of the piece is dominated by Adasiewicz's splendid dreamlike notes on vibes. The ballad "Jada" sees Berman sticking slightly the traditions of the Bob Carleton original, but allowing the Gang to spin off two-thirds of the way in to improvise. Jackson stretches the sound and elevates the group upward. This is sublime compositional skill from Berman who fuses benchmarks with new forms to create a piece that is fun, intriguing and delightful. Closing out with "Mobiles And Blues" provides the octet a chance to bring the session into the 21st Century. Harmonics and fallen structures all folding into final signal of goodbye and see you soon. There Now swings with creativity while bridging the gap between past and future. Josh Berman is also giving all of us a nice lesson of where jazz started and a new direction of where it can go. Highly involved and highly recommended.